Perfect PDF® & Print is an useful product suite for the private and business sector for creating, editing and managing PDFs or other electronic documents. Edit and annotate existing PDF documents, design document layouts, sign your PDFs or use other special PDF features and properties. Integration with popular Windows applications and many additional tools for managing your electronic documents make this software much more than just a PDF or print program. 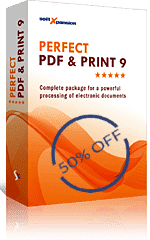 Get Perfect PDF® for only 24.99 €! Available only for a short time. XPS, images, PDF/A-1, -2, -3, .txt, and many more. If you have any questions about the program, please contact our support team.